Best friends Seahorse and Jellyfish loved their home in the cosiest corner of the rockpool. Every day Seahorse swept the sand smooth, untangled the seaweed and re-arranged his shells neatly on the shelf. Jellyfish lives with Seahorse in a rockpool. Jellyfish is bright and bubbly but not very tidy. Seahorse is neat and tidy and doesn’t like surprises. When Jellyfish organises a party without warning Seahorse, it all becomes too much. Seahorse leaves. The party gets more exuberant and their home becomes a lot messier. But when the party is over and everyone has gone home, Jellyfish realises that she’s lonely without her friend. She also realises how hard Seahorse has worked to keep things tidy. Over in another corner of the rockpool, Seahorse realises that she misses the bubbly personality of her friend and perhaps he should relax. The friends are reunited and learn the value of compromise. Illustrations are full page, bright and colourful. Big eyes and clear expression allow access to young readers. 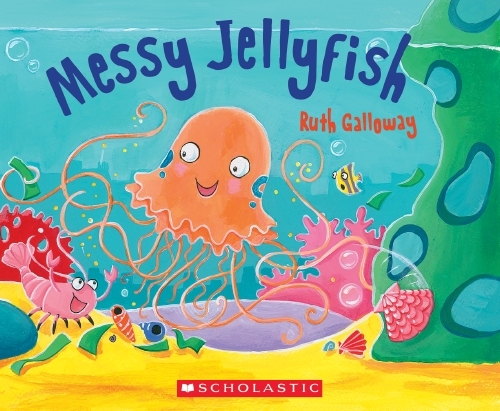 Messy Jellyfish’ features two friends who are the ‘odd couple’ of the sea. Each has positive characteristics but their differing priorities set the pair at odds. Their dramatic solution initially seems to work initially but both soon realise that despite their differences they want to continue to be friends. A bright and light story about the value of compromise, cooperation and friendship. Recommended for pre- and early-schoolers.